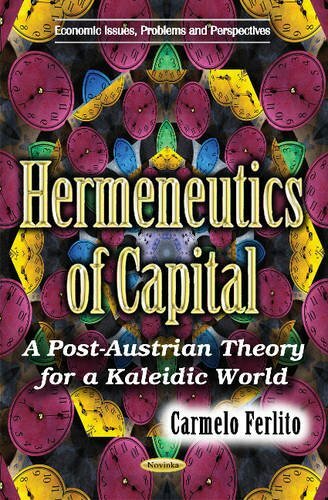 In presenting Hermeneutics of Capital, the author fears that most modern economists are not prepared or even interested in the approach that has been taken in this book. Today, economists are more likely to search for “exact” theories functional relationships between often logically independent variables rather than to question the nature of their science and its main task. This book argues that “economics is about human nature, human conduct and human institutions”, or what Mises called human action. The present book, however, is not an epistemological one. It is about capital theory. The attempt of Hermeneutics of Capital is to reconcile man and capital, which are often presented as competing elements in a conflictual world. What the author tries to do is even more than looking for a simple reconciliation; following Ludwig Lachmann’s application of hermeneutics to economics, the author tries to define capital as the outcome of subjective mental processes, determined by individual intentions and expectations and not by specific physical or economic features. The author defines the theory of post-Austrian. In fact, the author’s attempt is to further develop the Austrian School of Economics teaching, trying to contribute in enhancing concepts and theories which are believed to be necessarily reshaped. The author connected his capital theory with a consistent entrepreneurship theory, which goes beyond the usual contraposition between Kirzner’s and Schumpeter’s entrepreneurial theories and builds a synthesis centred on the idea of entrepreneurship as a subset of Misesian action involving specific capital formation processes. Moreover, the author took into account the traditional version of the Austrian Business Cycle Theory and critically revised it, arguing that crises are not simply the consequences of monetary manipulations, but they are the natural consequence of every expansionary wave. Shackle reminded us that a “good economist is like a bottle of wine. He must begin by having the luck to be laid down, as it were, in a vintage year, when he himself and his class companions are the high-quality stuff in which ideas and theories ferment and discourse sparkles in a glow of golden light. But this is not enough. He must mature”. This book helps guide readers to understand reality.